Buying a fish tank for the first time – especially online – can be confusing and overwhelming for a newbie to the hobby. There are so many to choose from and so many questions you might have. 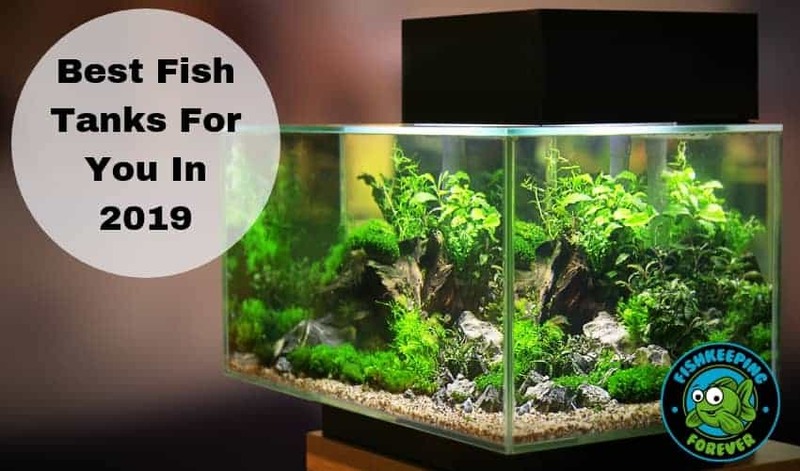 In this post the Best fish tanks for you in 2019, we will guide you through the process and help you make the right decision which best suits your needs. We have reviewed and inspected the Top 10 Fish tanks for beginners and selected these for a number of reasons. 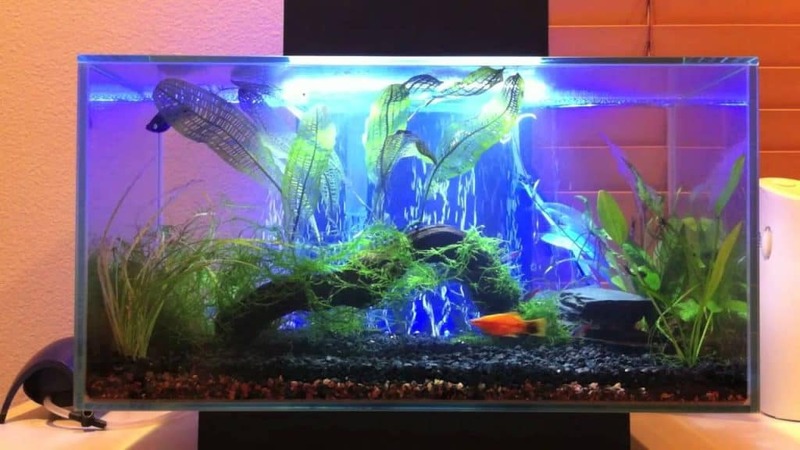 We have also considered the seller and the availability of the product and the feedback they have received from real customers who have purchased a fish tank from them. Below are a number of questions we would ask if we were buying a fish tank for the first time online. But first let’s see which fish tanks made it into our Top 10 Fish tank for beginners list, these are in no particular order. Our selection is based on size, price, performance, looks, and feedback from real purchasers on Amazon. 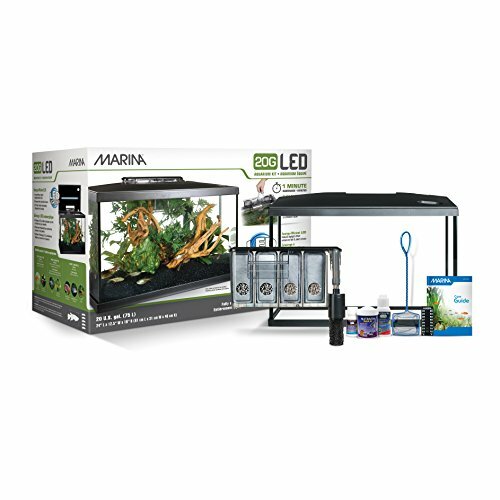 The Marina LED Aquarium Kit is perfect for beginners and newbies as it comes with everything you will ever need. The aquarium itself is available in about three different capacities, 5, 10 and 20 gallons. Firstly, it features an LED lighting module that resembles daylight. Not only is it beneficial for your fish, but the light is long-lasting, ensuring fewer maintenance checks. Furthermore, the kit includes a Marina Slim filter which you can clip on the side of the tank. The filter allows the tank to remain squeaky clean while the clip-on system allows for a quicker filter change. The Water Conditioner included in the kit helps make the water safer for your fish to breathe in. In addition to this, the complete set up comes with Fluval Max fish food which provides all the nutrients that your fish need. Also included in the kit is a biological supplement which further enhances a healthy diet. Lastly, the kit comes with an Aquarium Care guide that includes easy to understand instructions. All in all, the Marina Aquarium Kit is easy to set up and maintain and includes everything you need to get started. 1. Easy to set up and maintain. 2. Available in 3 different tank sizes to choose from. 3. Provides everything to ensure a healthy and safe diet. 4. Comes with tap water conditioner to make the water safe for the fish. 5. Adjustable lighting to resemble daylight using LED lights. 1. Limitation on the filter for saltwater use. 2. Lighting not suitable for all species. 3. The filtration system can be noisy if not cleaned regularly. The Fluval Flex Aquarium Kit is the perfect all-in-one solution for all your aquarium needs. Most users quite liked the medium 15-gallon capacity as it is big enough to house multiple fish. However, the defining feature of the Fluval Flex is the curved front which grants it a more modern look. Also included is a powerful and strong filtration system. The filtration takes place in several stages, ensuring clean and healthy water for your fish. These stages include mechanical separation, chemical separation as well as a biological one. The kit also includes an LED lamp that helps enhance plant growth. Another feature that most users like is the remote control. With the Flexbad Control, you can control a wide variety of lighting and introduce special effects such as cloud cover. 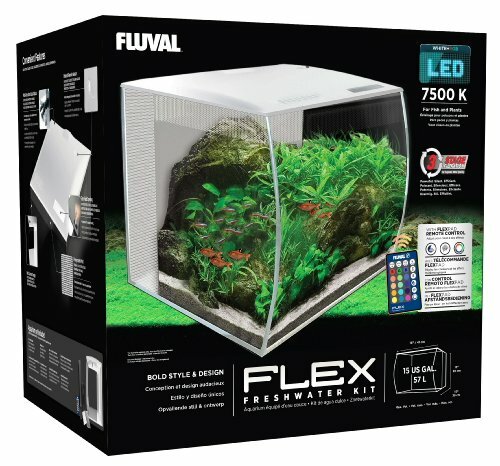 Overall, the Fluval Flex 57 allows you to customize your aquatic tank according to your needs and those of your fish. With over 1200 sold on Amazon, this aquarium has proven to be very popular and we can see why, it’s easy to set up and very stylish and all at an affordable price. We can see plenty of great reviews and it came out at 4.6 out of 5 stars from some suppliers. Definitely one to consider! 1. Large enough to house a good size community of fish. 2. Modern and contemporary style with a curved front. 3. Allows you to control lighting settings. 4. Includes a three-stage filtration system. 1. A section of the tank is closed off for the filter, so the capacity is overstated. 2. Large filter intake where very small fish and fry may get trapped. The MarineLand Contour Glass Aquarium Kit is a rather stylish kit that allows you to kickstart your aquatic hobby. The kit is available in two different capacities, namely 3 and 5 gallons. This is perfect for a single or a couple of small fish and would be perfectly suited for keeping Bettas. The featured curved glass adds an element of elegance to your aquarium. In addition, the LED lighting system is quite energy efficient. It helps you save money. The bright lights feature two different settings, moonlight, and daylight. Also, the lights are hung at the top via a rail. As a result, you can show off your brilliant aquatic setting and the bright colors of your fish. Another feature that most users admire is the 3-stage filtration system that ensures a healthy and clean environment. The system easily filters all dust, dirt, chemicals and even bacteria. Also, the glass canopy allows you to easily access your fish for feeding or other purposes. Although these aquariums are small in size they are perfect for 1 or 2 fish like Goldfish and Small freshwater fish like Neon Tetra and Guppy. We wouldn’t recommend this size aquarium for a first saltwater aquarium as the correct water qualities needed would be difficult to maintain. 1. Canopy is easy to access and prevents fish from jumping outside. 2. Keeps water healthy and safe for fish due to 3-stage filtration. 3. Available in two different capacities. 5. Easy to set up and maintain. 1. Light not sufficient for plants. 2. The filter area is cramped. If you’re looking for a stylish aquarium that requires little care from your part, then the Fluval Sea EVO XII is the way to go. Personally, this is one of my favorite starter aquariums. The 13.5-gallon tank is quite sufficient for holding multiple fish in it. The honeycomb design helps conceal the filtration area so you can maintain the elegant look of the tank. Furthermore, the water filtration system is extremely efficient. Users found that during each water change, the system fills the tank to a much higher level. As a result, you find lesser surface agitation from the output. Also, the filtration system includes three stages including mechanical, chemical as well as biological. The canopy makes it easy to feed as it comes with an easy-feed door. Moreover, the aluminum frame is waterproof and adds longevity to the tank. What’s more is that the lighting system can be started with a single touch. 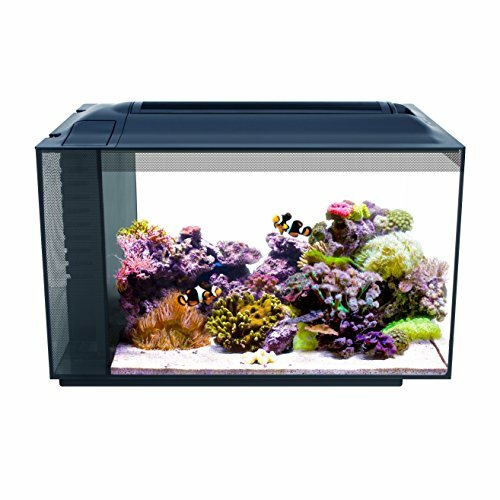 If you would like to use this aquarium for saltwater fish you might need to add a protein skimmer to help the small but effective built-in filter. There is limited room in the filter unit to add a protein skimmer you may need to add an external one. The Fluval MINI PS2 skimmer would be a perfect skimmer for such a size tank. 1. Easy to feed through the canopy door. 2. Lightweight yet durable aluminum frame. 3. Three stage filtration system ensures maximum agitation and cleanliness. 4. Sufficient capacity for multiple fish. 5. Filtration area is concealed. 1. The plastic over the filter is quite cheap. 2. The lid may be a bit ill-fitting. The Aqueon 10 Gallon Kit is an all-encompassing solution that helps bring your aquarium to life. The kit includes a 10-gallon tank that comes with a low profile hood. We noted that the hood is fixed with vibrant LED lights as well as an easy-access feeding door which made it perfect for children to use and keep in their bedrooms. If you’re worried about noisy filtration, especially if you’re planning to have this in a bedroom, then fear not, the Quiet Flow Pro filter is absolutely quiet and features a 5 stage filtration instead of the usual three. A red flashing light indicates when it’s time to change the filter. This includes an ammonia filter to help keep your fish healthy. Moreover, a complete aquarium setup guide is provided that helps you know all the ins and outs of the tank. 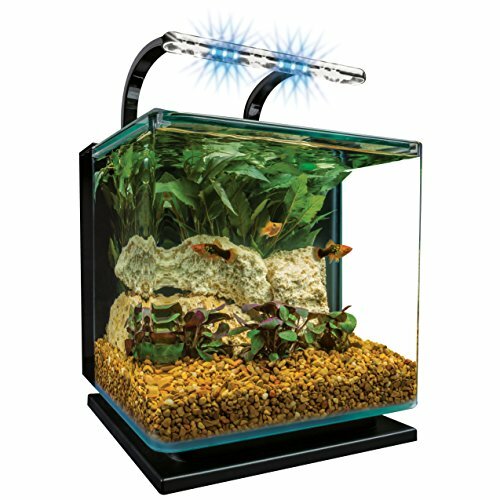 Also included is a preset heater that helps you keep your tank at an optimum temperature. Other accessories include fish food, fishnet, thermometer and a water conditioner. 1. Quiet,five stage filtration system. 2. Includes all kinds of accessories you will need. 3. Indicates when it’s time to change the filter cartridges. 5. Heater shuts down automatically to prevent overheating. 2. Hood is not hinged so cleaning the aquarium means lifting off the hood. The Fluval Spec V Aquarium Kit is yet another small aquarium perfect for desktops and smaller areas. The tank has a capacity of about 5 gallons, which is quite sufficient for smaller fish. The etched glass and aluminum construction ensures a lightweight yet practical design. Included with the kit is an overhanging lighting system consisting of about 37 LEDs that allow for vibrant illumination for all plants and animals. We found that the tank maintains clean water due to the powerful circulation pump. Furthermore, the tank includes a three-stage filtration system that ensures crystal clear water. In fact, the kit includes all that you need to ensure proper filtration such as activated carbon, a foam block as well as Biomax Rings. The best part is that the filtration system is in the back chamber and hidden from sight. With over 82 reviews on Amazon and scoring 4.1 out of 5, we have to agree with the customers that this aquarium is a perfect fish tank for beginners. We really liked the LED lights which stay cool, cost less to run and look amazing at night. Apart from the size: 5 Gallons we couldn’t find much to fault this aquarium. We would love to see this in 25-30 Gallons. Please make one Fluval! 1. Lightweight and durable construction. 2. Powerful circulation and filtration system. 3. Cleans up all dirt, dust, and chemicals all in one compartment. 4. Ensures proper illumination of all plants and animals. Best LED Aquarium Lights Here! 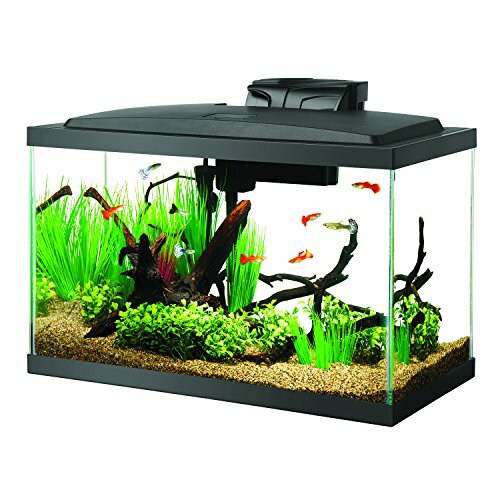 Another Kit that comes with a quiet filtration system is the Tetra 20 Gallon Kit which includes a 20-gallon tank, a mini heater, an LED hood, a filter, a plant mat as well as four artificial plants. These artificial plants are perfect for those who do not want to deal with the hassle of caring for live ones. Plus, they give your fish a place to hide when they need to release stress. The construction includes scratch resistant glass and an LED hood that provides a natural daytime effect. Furthermore, the mini heater included in the kit allows you to maintain sufficient temperature for you to keep tropical fish. The Whisper filtration system ensures a powerful and clean water flow without being too noisy. However, that’s not all! The kit mixes beauty with utility as it also includes a thermometer, adapter, frame hinge, fishnet, and a care brochure. 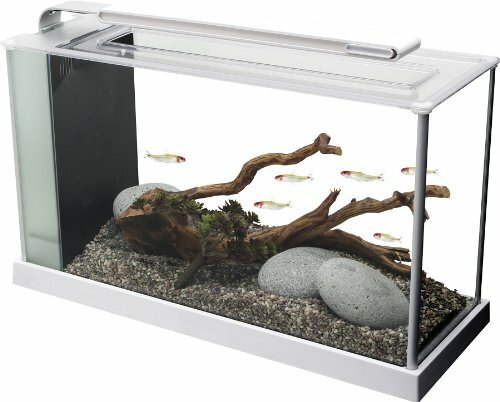 This is a basic aquarium perfect for a beginner, however, it’s not the most stylish and is as basic as they get. If you’re looking for a coldwater aquarium then this would be the one. We don’t think it’s suitable for saltwater fish as the filter is not suitable for the quality of water that marine fish need. We do think it would suit freshwater catfish like Corydoras Sterbai and Loaches such as Yoyo Loach and Clown Loach. 1. Ultra quiet filtration system. 2. Includes a large variety of accessories including nets, thermometer etc. 3. Comes with no-hassle artificial plants. 4. Scratch resistant and durable glass. 5. Maintains sufficient temperature inside the tank for tropical fish. 1. The light isn’t sufficient for plant growth or saltwater invertebrates. 2. Also, the light needs to be manually turned on and off as there is no timer setting. 3. Not suitable for saltwater fish without needing another filter adding and better lights. The Coralife LED Biocube Aquarium is a one of a kind aquarium kit that includes various accessories to fulfill your aquatic needs. This includes a sleek and modern hood that is integrated with LEDs which enhance color and add beauty to your tank. What most users find unique about the Biocube is the 24- hour timer that allows you to control the LED lighting. The automatic 30-minute sunset and 60-minute moonset functions replicate the real-time day and night cycle. Another interesting feature is the small, quiet submersible pump that ensures water keeps flowing. Furthermore, the customizable built-in filtration system is quite easy to set up and maintain. The tank is available in a variety of two sizes, including 16 and 32 gallons. All in all, the Biocube is the perfect aquarium for all your aquatic life to thrive. We found that the smaller 16 Gallon tank would make a perfect Nano reef tank for those wanting to try this specialist type of aquarium and the bigger size is perfect for saltwater fish. The quality of this aquarium shows and it stood out from the rest. One our favorites for sure. 1. You can customize the tank as well as the filtration system. 2. The setup and maintenance is easy and simple. 3. Includes a timer for automatic control of the lighting. 4. Replicates the complete day and night cycle. 5. Keeps water clean and fresh and low maintenance. 1. The instructions might be a little confusing. 2. We found the timer difficult to set up. 3. Only 2 sizes available. The Aqueon Ascent is full of style and elegance with a frameless tank that includes polished edges. Also included is a floating vase as well as an angled top that grants it a truly unique silhouette. The Aqueon Ascent is as practical as it is stylish. The angled top helps reduce the visibility of the water line while the glass canopy provides easy access to the filtration system. As a result, maintenance is much easier and simpler. Furthermore, the kit includes a QuietFlow Power Filtration System that ensures all of the water is clean and dirt free. Moreover, the kit includes extra filter cartridges which make it easier to replace. Also included is a setup guide which makes it straightforward to set the whole aquarium up. Water Conditioner and Fish food samples allow the user to test out other Aqueon products. 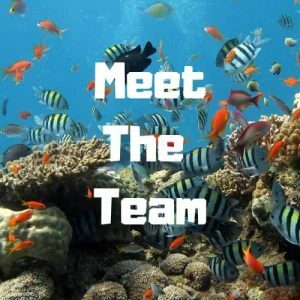 We found this very easy to set up and would suit a total fishkeeping beginner. The aquarium has a great look and looked even better with the LED lights lit. Perfect for smaller freshwater fish such as neon tetras, Mollies, dwarf gouramis and siamese algae eaters. 1. Elegant and unique style. 2. Minimizes the visibility of the water line. 3. Easy to set up and maintain without any hassles. 4. Includes a quiet and powerful filtration system. 5. Includes vibrant LED lights to draw attention to the aquascape. The Fluval Edge Aquarium is available in two sizes: 6 gallons and 12 gallons. What’s particularly unique about this aquarium is that its glass is sealed on all 6 sides allowing you to view your fish from more angles. Plus, you can fill the tank up to the brim and find reduced evaporation and higher oxygen exchange. Furthermore, the compact design allows you to place the aquarium in all manor of limited spaces. Also included is a 3-stage filtration system that is hidden at the back. The system not only ensures clean and fresh water but allows for a quieter operation so your fish remain undisturbed. Moreover, the aquarium takes a couple of minutes to assemble and clean. The 7600K LED lighting system ensures your aquascape pops out with vivid colors. The LED lighting includes three different controls including night time, day time and an ‘off’ position. If you’re looking for the most stylish fish tank for a beginner then this is it. We found the rimless aquarium has a unique edge compared to all the other aquariums we reviewed. 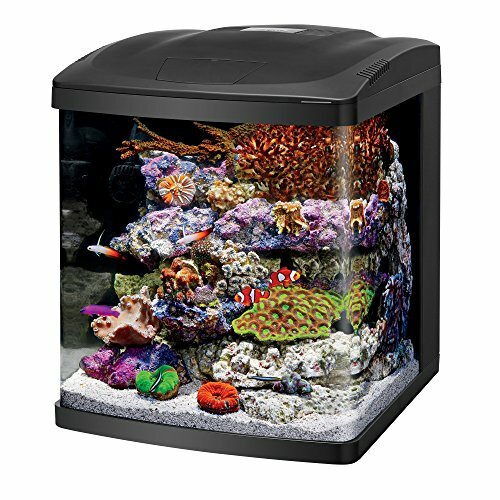 This tank is only available in 6 gallons and 12 gallons, so you’re limited to the variety of fish you can keep and the filter included isn’t suitable for saltwater. This would make a fantastic coldwater aquarium with Black Moors and Oranda Goldfish. The tank can be filled up to the brim for better oxygen exchange. Includes a 3-position switch with vibrant LED lighting. Filtration system and other wiring are hidden from plain view. Easy and quick to assemble and clean. Some corners are a little hard to reach. No lid so don’t buy fish that like to jump! Q: Is the size of the aquarium important? A: Yes. As responsible pet owners we have a duty to give our fish the best quality water they can to live in. Small aquariums are very difficult to maintain good water quality. The bigger the aquarium, the easier you’ll find it to look after. Q: Will I need to buy any other equipment? A: Some of these aquariums come with filters, lights, and heaters all built-in. So, all you’ll need to do is add gravel or substrate and water. See which ones are complete setups ready to go below. Q: Will it be delivered safely with it being glass or fragile? 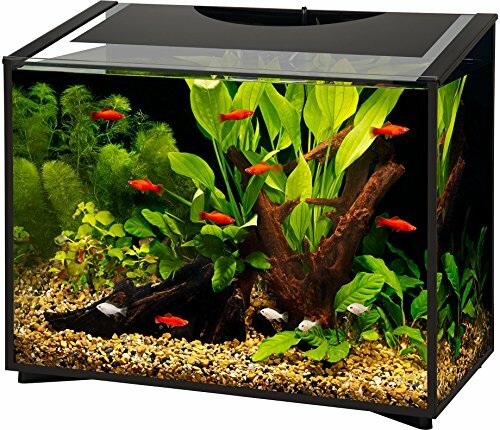 A: All the fish tanks below are available from Amazon which is our preferred place to buy them online because you are covered by all the normal Amazon guarantees. They are the world’s biggest online retailer and can be trusted. If you’re a prime member you will also get fast delivery to your door. We have reviewed lots of feedback left from real customers who received their fish tanks from Amazon and most were happy and the tank arrived safely. Like any postal service there can be the odd disaster but like we say you are covered 100% by Amazon’s terms and conditions of sale. Q: Are these fish tanks cheaper than my local pet store or aquarium supplier? A: We can’t guarantee that every tank is cheaper, you’ll always find the odd bargain at your local pet store. The majority of the aquariums below are cheaper and delivered to your door. No heavy carrying involved. 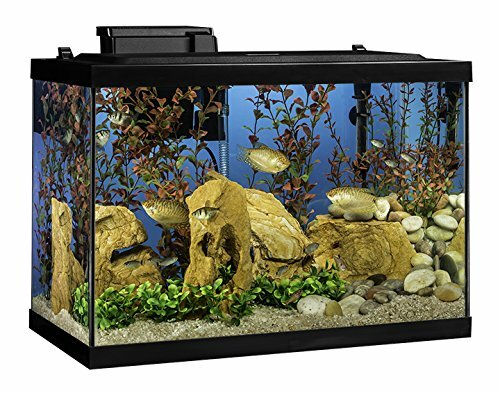 Q: Which fish tank in this TOP 10 FISH TANK REVIEW is the best? Each one is different and all have sold in large numbers online so they all have something special about each one. If I had to choose one though it would be FLUVAL EVO XII tank. It has a built-in 3 stage filter and day & night lighting fitted into the canopy. Just add water! Q: How easy is it to set up and run one of these fish tanks? A: These fish tanks are the easiest options for anyone starting an aquarium for the first time. Most come with everything you’ll need to start your first aquarium. However, you’ll still need to learn how to look after your new fish tanks and how to keep your new fish healthy. Read our Beginners Guide To Starting A Fish Tank, it will help you learn all the basics you’ll need to run a successful aquarium. What Type of fish should you keep? With hundreds of different species to choose from it can be difficult to choose which type of fish you should keep. Many will say that Coldwater fish are the easiest to keep and set up closely followed by Tropical freshwater fish. Saltwater fish are best kept once you have gained some experience in fish keeping however with these aquariums it may be worth dipping your toe in the Saltwater aquarium waters. Just ensure you buy one of the larger aquariums as maintaining the correct water qualities needed for a saltwater aquarium is very difficult in a small aquarium. 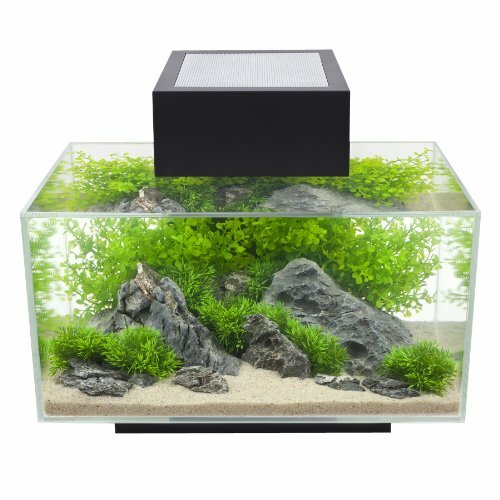 Have a look at Nano aquariums and you’ll see some amazing examples of smaller saltwater fish tanks, but they are very difficult to set up and maintain. No matter which type of aquarium you decide on keeping, you’ll need to perform regular water changes and test the water qualities which will help you avoid any costly mistakes and prevent you losing your beloved fish. The process of setting up a Tropical Fish tank and a Coldwater tank are very similar. The only real difference is that tropical fish need a heater to warm the aquarium water. Saltwater is very different and we’ll go into that in more detail further in the article but basically, the water will be warmed by a heater and the water contains salt. The filtration and lighting are also different and the water conditions need to be checked regularly for changes which you’ll need to react to, to ensure the best water conditions possible which saltwater fish need in order to thrive. All fish need great water conditions but Tropical freshwater and Coldwater fish can tolerate poor water condition better than saltwater fish making them easier for beginners to keep. When your aquarium water has gone through the full cycle and the water is safe to start adding fish you need to know the correct way to acclimatize your new fish to the water in your tank. What is the water cycle I hear you ask? Well, Fish produce ammonia which is harmful to your fish. The nitrogen cycle (also known as the water cycle) is the process that breaks down toxic nitrogen waste (poo) in your fish tank into less harmful components. For this cycle to work, beneficial bacteria that feed on these waste products need to grow in the aquarium’s filter system. Filters use biological media to help the good bacteria grow and turn the harmful ammonia (toxic) to convert to nitrite (toxic), then nitrite to nitrates (non-toxic) unless it’s in high amounts. This takes time, typically for a tropical fish tank we would advise leaving it set up and running for around 2 weeks before adding fish, the same for coldwater fish. Saltwater aquariums can take much longer, around 6-8 weeks and the conditions must be monitored until safe levels are achieved. Test kits are available for both Freshwater/Coldwater & for Saltwater fish. Adding fish to a fish tank without a healthy nitrogen cycle in place is dangerous to the fish and can and often does lead to their death. What is acclimatization? Acclimatization is the process of introducing fish to a new environment without causing stress or any sudden changes. What this means is that the water temperature in the bag you have brought home with you will have cooled down significantly. Therefore you need to acclimatize the water in the bag to the water in your tank so your fish don’t get a shock to their system when you add them to their new home. The best way to do this is to open the bag and roll the plastic bag down to form a float around the bag. Then float the bag in the tank for 20 minutes. Slowly add a small amount of water from your tank into the bag every 5 minutes or so until the bag starts to sink which should take around 30 Minutes. This will allow the water temperature to stabilize and the water properties ie: pH, salinity, and hardness to equalize. Then take the fish out of the bag with a net and gently add it to the aquarium. Don’t tip the water from the bag into your aquarium as this could introduce disease into your aquarium. Dispose of the water down the drain. Don’t be tempted to simply open the bag as soon as you get home and tip both the water and fish into your aquarium. You run the risk of stressing the new fish which could kill it as well as introducing disease into your tank. Neither is a good thing! Once you have set up your new aquarium and let the water qualities settle and you’ve chosen a few beautiful fish you now need to feed them. This sounds simple, right, but how much and when should you feed your fish? The simple rule when feeding any type of fish is to feed them small amounts regularly. Give them as much food as they can eat within 2-3 minutes. If they are taking longer to eat the food the chances are they are full and the food they don’t eat will fall to the bottom of the tank and pollute the water. If you over-feed your fish it can lead to all sorts of problems from poor water quality, green algae, and even disease. Never over-feed your fish! This is rule number one, if you do accidentally overfeed your fish then read our article ‘ What to do if you overfeed your fish?. Your fish will sometimes keep asking for food even when they are full. Don’t be tempted to keep feeding them, you need to be strong and stop feeding them. 3-4 times a day in small measures is the best idea and the kindest thing you can do to a healthy aquarium. We hope you have found this review of the Best Fish Tanks For You In 2019 helpful and we hope you set up and enjoy a successful aquarium for many years to come. No matter which one you choose, the fact that you have now purchased your first aquarium means you’ll be hooked for many years if not forever. Once I was bought my first aquarium for my bedroom, I never looked back and have owned many over the past 30 Years but I’ll never forget the first fish tank I ever owned. Good luck with your new aquarium and please feel free to let us know how you get on or email us if you need any advice.